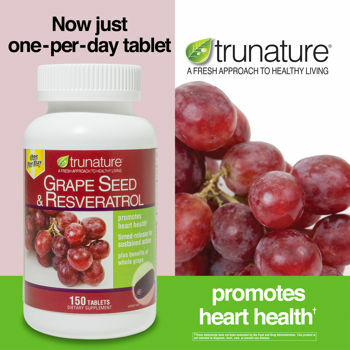 Trunature® Grape Seed & Resveratrol - 150 Timed-Release Tablets SALE! Suggested Use: Adults - One tablet daily with food as a dietary supplement. Warnings: Pregnant or nursing women, individuals taking medication(s), or persons who have a health condition should consult their physician before using this product. Important: Tamper evident seal under cap. Do not use if printed seal is broken or missing. Store at 15° - 30° C (59° - 86° F).